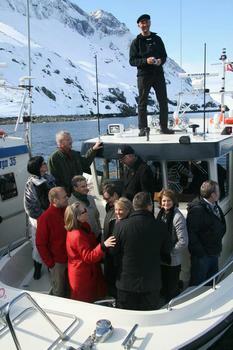 NUUK, Greenland, May 12, 2011 (ENS) – Eight member states of the Arctic Council today signed an agreement that coordinates life-saving international maritime and aeronautical search and rescue response across an area of about 13 million square miles. Signed by Canada, Denmark, Finland, Iceland, Norway, the Russian Federation, Sweden and the United States, the agreement is the first legally-binding instrument negotiated under the auspices of the Arctic Council. U.S. Secretary of State Hillary Rodham Clinton participated in the meeting, the first time that the United States has been represented by a Secretary of State. 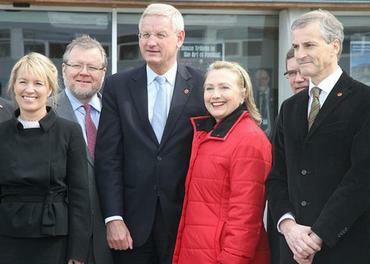 “This region faces so many challenges, especially with the harmful effects of climate change on its ecology, natural resources, and the livelihoods of millions of people who are used to living off the land and the seas,” said Clinton. Today, the Council formed a new task force that will negotiate measures for oil spill preparedness and response throughout the region. As Arctic temperatures rise and sea ice coverage decreases, ship-borne activities are increasing. Flight traffic also is on the rise as new polar aviation routes cross the Arctic air space in several directions. As human activities in the Arctic expand, the potential for accidents increases as well. Limited rescue resources, challenging weather conditions, and the remoteness of the area render search and rescue operations difficult in the Arctic, making coordination among the Arctic nations imperative. Mapped out by a task force co-chaired by the United States and the Russian Federation, the agreement will improve search and rescue response in the Arctic by committing all Parties to coordinate appropriate assistance to those in distress and to cooperate with each other in undertaking search and rescue operations. For each Party, the agreement defines an area of the Arctic in which it will have lead responsibility in organizing responses to search and rescue incidents, large and small. Parties commit to provide search and rescue assistance regardless of the nationality or status of persons who may need it. The Council also announced the results of two scientific studies – an assessment on snow, water, ice, and permafrost in the Arctic, and a report on the warming effects on the Arctic climate of short-lived climate forcers such as methane, and soot, or black carbon. The second report proposes measures the eight Arctic countries can take to limit their emissions. The United States recognizes that robust polar science cooperation is crucial to the ability to formulate useful policies for the region, and encourages the Arctic countries to take steps commensurate with the gravity of the reports’ findings. The climate issue is especially acute in the Arctic, since temperatures there have risen twice as fast as those the rest of the world. 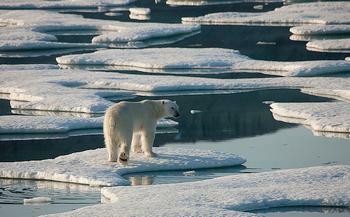 “The Arctic is facing decisive changes at present. A responsible, joint policy for the region is the alpha and omega, and not only for the countries around the North Pole,” said Carl Bildt, minister for foreign affairs of Sweden, which now takes the two-year chairmanship of the Arctic Council. At the Nuuk meeting today, the Arctic Monitoring and Assessment Programme, a working group of the Arctic Council, released an assessment report on the impacts of climate change on Snow, Water, Ice, and Permafrost in the Arctic. The report is the culmination of a multi-year study that included contributions from scientists and indigenous groups from all eight Arctic states and additional expertise from non-Arctic communities as well. The researchers report that the last six years (2005-2010) have been the warmest period ever recorded in the Arctic. Based on temperature measurements going back to around 1880 and using evidence such as lake sediments, tree rings and ice cores, Arctic summer temperatures over the past few decades have been higher than at any time in 2,000 years. The extent and duration of snow cover and sea-ice have decreased across the Arctic while the temperature of the permanently frozen ground has risen by up to two degrees Celsius over the last few decades. The largest bodies of ice in the Arctic – multi-year sea ice, mountain glaciers, ice caps and the Greenland Ice Sheet – have all been declining faster since 2000 than they did in the previous decade, which may have a significant impact on the acceleration of sea-level rise in the future. Global sea level is projected to rise by 0.9 to 1.6 meters (2.95 to 5.25 ft) by 2100, and Arctic ice loss will make a substantial contribution to this. The study found that model projections reported by the Intergovernmental Panel on Climate Change in 2007 underestimated the rates of change now observed in sea ice. The Arctic Ocean is projected to become mostly ice-free in late summer within this century, perhaps within the next 30-40 years. Changes in the cryosphere cause fundamental changes to the characteristics of Arctic ecosystems and in some cases loss of entire habitats. Arctic infrastructure, including roads, sewer systems, and runways, is at increased risk of damage due to changes in the cryosphere, particularly the loss of permafrost and land-fast sea ice. Loss of ice and snow in the Arctic accelerates global climate warming because the darker surface absorbs more of the Sun’s energy, the report concludes. It could also turn the Arctic into a net source of carbon dioxide and methane and change large-scale ocean currents. The study acknowledges that there remains a great deal of uncertainty about how fast the Arctic cryosphere will change in the future and what the ultimate impacts of the changes will be. Feedbacks between elements of the cryosphere and the climate system are particularly uncertain.